In this series of articles we'll write about one Mario game every day for 30 days, each representing a different year as part of our Super Mario 30th Anniversary celebrations. In our final entry for Mario in the 20th Century we reach the beginnings of one of Nintendo's most vital franchises. While not strictly a 'Mario' game, the mascot is typically front and centre in marketing for the title, and his inclusion was a key early factor in the game achieving success. Yep, it's just an excuse to talk about it. With the sales success, critical acclaim and the growth of the eSports scene around Super Smash Bros. Melee in particular - though Super Smash Bros. for Wii U is gaining momentum in the competitive field - the Nintendo 64 original is often overlooked. Far more limited and rudimentary than its ambitious follow-up, it was an integral gamble that paid off and, as a result, set in motion what was to come. Developed in 1998, it began as a secondary private-time project instigated by Masahiro Sakurai and driven forward with the late Satoru Iwata, both working at HAL Laboratory at that time. In an Iwata Asks interview both men reminisced over working on the project outside of office hours; they were the only core staff in the prototype phase, with Sakurai-san working on "planning, specs, design, modelling and movement" and Iwata-san working on the programming. 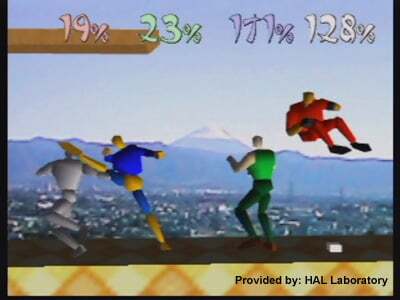 The original prototype was called "Dragon King: The Fighting Game" and featured generic, faceless characters. The core desire was to create a 4-player Battle Royale experience as a counterpoint to the dominance of 1 vs 1 fighting games, and utilising Nintendo characters was seen as pivotal in making it a success. The early prototyping was completed without approval to use Nintendo IP, but the addition of these characters took the project onto a new level. Iwata: Even though all we had in our first prototype was four faceless characters on the screen, the game took off in a completely different direction with the addition of Nintendo characters. Can you remember how this change came about? Sakurai: Of course. I asked to use Nintendo characters since it was so hard to accurately convey to the players the atmosphere of the gaming world where they play a fighting game on home console. You have to have some main characters in a fighting game, and when you line up character 1, character 2, character 3 and so on, the main characters end up blurring together. With a game for the arcade, it's okay for character development to take a backseat since players are content with the fighting. With a fighting game for the home console, however, you have to set up the general image or the atmosphere of the gaming world right from the start or else the game suffers. That's why I asked to use Nintendo characters. Iwata: Nowadays, we take it for granted, but at the time, people had reservations about mobilizing an all-star cast of characters. Iwata: I guess fans were upset by the prospect of pitting characters like Mario, Link and Pikachu against one another. We had a hard time convincing them the fun and depth that were so obviously present in the Smash Bros. trademark fighting style would offer. In comparison to its successors this original game was extremely limited in scope, with minimal single player variety conceding the limelight to multiplayer. As was the case in previous entries in this article series, namely Mario Kart 64 and Mario Party, the ability for four players to take part at once was hugely exciting at the time. The small cast of 12 characters was appealing, too; bear in mind that, as highlighted in the Iwata Asks segment, seeing these characters fighting each other was unexpected. While the original vision of Sakurai-san and Iwata-san was a relatively simple concept, it was a fresh gaming experience once on the market. Customisation of items, free movement around the stage, and of course the core idea of raising an opponents percentage to smash them off screen - all of these ideas contributed to an experience that felt unlike other mainstream fighting games. Sakurai-san's eye for detail also ensured it was mechanically sound and complex, too, though this one's successors would take that depth to new levels. In striking a nerve and shifting millions of copies, Super Smash Bros. on the Nintendo 64 gave birth to a hugely important franchise and significantly changed Masahiro Sakurai's career. It's also another reminder that, although Satoru Iwata would go on to become President of Nintendo, he was first and foremost a skilled programmer and gamer. I still remember the commercial. I went out and got it the same day I saw it. @NintyMan you're 100% right. It's been confirmed that those generic fighters eventually became capt falcon. This game is a decent game to go back to. Even though it is limited with attack moves and modes compared to the sequels, the modes that are in the game are still good. The 1 player mode was fun (but Melee's Classic mode was better) and Board the Platforms was interesting to play. Break the Targets is always fun. The controls can also feel stiff sometimes. The music is good. Multiplayer was definitely the best part of the game. Overall, while I prefer Melee and Brawl (Probably just for the content that's offered) this game is still good, even if it doesn't have as much to offer as the later games. @NintyMan I would love a return to individualized stages for each character for 'break the targets' and 'board the platforms', especially considering board the platforms was way more fun than break the targets in my opinion. I hated how the later games used the SAME 'break the targets' stage for every single character. A return to the 'race to the finish' minigame would be a very welcome change, too. I wonder why those cool little features were removed as the series went on? I remember just sort of stumbling into the game's webpage way back in the day... and this was late 90s/ early 2000s, so, it was pretty bad looking. Also, I have this game to thank for introducing me to Earthbound. If it weren't for this game, I wouldn't have been researching the Earthbound series, due to Ness' playable appearance. Other than that, Super Smash Bros still serves as one of my fond memories of the N64 and (for the time) a reason to bring friends over. The two things I hope from this game are for its Wii U VC release, as well as Mushroom Kingdom 64 stage as Smash 4 DLC, my all-time favorite Smash Bros stage. @DarthNocturnal Super Smash Bros. is the only series that always reminds everyone of the past Nintendo franchises: Ness, and Captain Falcon in SSB64; Mr. Game and Watch, Fire Emblem, and Ice Climbers in SSBM; Snake, Sonic, R.O.B., Diddy Kong, Pit, and Lucas in SSBB; Duck Hunt Duo, Pac-Man, Mega Man, Ryu, and Shulk in SSB4 (for WiiU & 3DS). Tbqh, this guys weren't that noticeable, until Smash made them relevant. My first Smash experience was Brawl. I sucked at it but saw how awesome Smash4 is so I purchased it as a complete beginner and with a lot of practice got pretty decent. Downloaded on VC and able to play all iterations with the GC controller. That's just perfect. Smash 64 was a sublime multiplayer game (up there with Mario Kart 64, GoldenEye, et cetera). It hasn't aged well, but for what it's worth, it's a great nostalgia trip. Man, that commercial brings back memories. I was in the 6 grade at the time and I loved seeing it. Smash Bros is one of the main games I played on the N64. Iwata's genius was all over this title; Sakurai-san you still get love! For I time I actually thought this was the best game I ever played. And later, for a even longer time, I thought Melee was the best game I ever played. That's still one of the best commercials Nintendo's ever made. Anyway, I miss the powerful throws this game had. In the sequels, grabs and throws devolved into a minor tactic for racking up some quick damage when close in or to get past a shield, but it's very rare to actually KO someone with it (aside from suiciding with Donkey Kong). However, in the original game, those throws had some real launching power to them, which made them much more fun and rewarding to use. it's not like it was a one-off NES game like Ice Climbers. Snake and Sonic were not at all obscure when Brawl came out either, and Pac-Man and Ryu are pretty well known. Even my grandparents know of Pac-Man and Street Fighter V is coming out relatively soon. Everyone's talking about how great the multiplayer is, but I've only ever played it solo. I probably beat Master Hand 30 times. I remember cursing Metal Mario for being so hard to launch.